Barbecue, for Better or for Worse – Marie, Let's Eat! In several previous chapters, I have sung the praises of various children’s museums in Tennessee, but I have not taken the time to really talk up the very good one that we have in Atlanta. Since we are members here, we’ve been watching our baby grow in the toddler area since he was about six months old. It had been a few months since we were last here, and at that time, he completely drenched himself in the fishing area. Resolving that this time, we’d not let him get soaked from head to toe, we felt he was big enough, at nineteen months, to explore the rest of the exhibits. The Children’s Museum of Atlanta opened in 2003, and it is among the best of those where we have taken the baby. We came on a very busy Saturday, with Santa Claus, Radio Disney, and the North Georgia Tinplate Trackers train hobbyist group all in attendance and bringing huge crowds, but the baby never felt overwhelmed. Of course, many of the exhibits are still a bit over his head – it is absolutely perfect for ages three to seven – but he still found lots to play with. Proving that most kids are awfully alike, he enjoyed many of the most popular attractions for the smaller ones, like the Moon Sand and a big John Deere tractor and a couple of slides. A note about the good people of the North Georgia Tinplate Trackers: these guys don’t get nearly as many opportunities to show off their incredibly fun interactive trains as they should! Their big square modular table features dozens of buttons that guests can press, each one affecting the landscape or backgrounds, doing everything from turning on police car lights to starting up amusement park rides to sending Harry Potter and Voldemort into an aerial chase. If you want to get a mob of kids to have fun, these guys know how to do it. Our baby loved watching the trains and seeing all the background fun, and so did dozens of other children. Anyway, while the Trackers are only present for a week or so each December, The Children’s Museum of Atlanta is open year-round and is completely wonderful for kids. Usually, I recommend that after a visit, since you’ll have paid to park already, it’s worth the six or seven minutes it takes to walk through Centennial Olympic Park to Googie Burger for lunch, but on this particular Saturday, we had plans out in Douglasville. We really hoped that the busy morning and the half-hour drive would have knocked him out for a nap, but, sadly, he stayed awake, wild and disagreeably cranky, as we arrived at S’More BBQ. Marie and I had the pleasure of meeting Lucy Mercer of A Cook and Her Books, a blog that we hope you all read, at an event for Firehouse Subs last month, and she asked me to keep her in mind the next time we wanted to try some new barbecue. I remembered that there was a barbecue place in her neck of the woods – I actually spotted S’More from the highway on the way back from my Circumnavigation of Alabama – and hoped to meet up with her there. 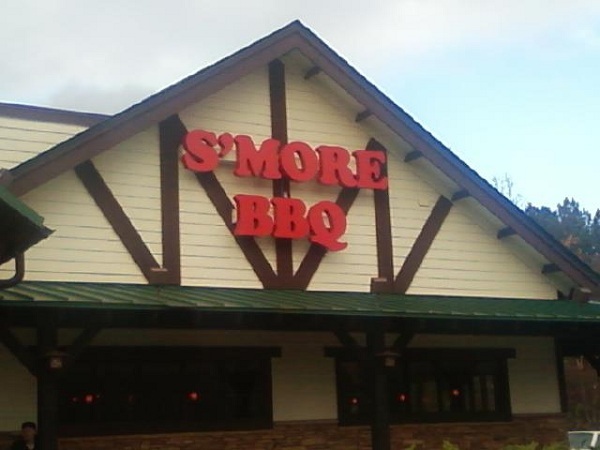 S’more occupies a former Smokey Bones location. This is a curious company that was once a Darden-owned barbecue concept, but it’s now owned by Sun Capital, who also own Captain D’s, Grandy’s, and Sweet Tomatoes. They closed many underperforming stores, leaving, I believe, only one in Georgia, and rebranded it as a “Fire Grill,” de-emphasizing barbecue. From what we saw on our trip to the midwest – stay tuned! – it has more of a presence up I-75 than in our neck of the woods. As for S’More, well, we certainly enjoyed visiting with Lucy and one of her young daughters, who was totally rocking some pink glam rock boots and who played a mean game of Tic-Tac-Toe against our girlchild. We talked about some of our road trips, past and future, and we expressed some envy over Lucy’s recent visit to south Alabama. And then there was the food. I’ll not belabor this point. S’More offers some pretty tasty barbecue along with a host of other options on an expansive menu, and they do so at a quite nice price, particularly at lunch, when they have a whole page full of specials. But the experience was marred by the comically awful service that had us looking for hidden cameras. In our unfortunate server’s defense, it is breathtakingly wrong to assign one person to work both the hostess station for the whole barn as well as six to eight tables. I doubt even the most experienced and competent employee could handle that with grace. To belabor the point would be both cruel and boring, so we’ll simply state that mistakes piled up, questions went unanswered, and corrections took an eternity to resolve. When next we meet up with Lucy, we will hope for a better restaurant experience. All the while, the baby stayed cranky and demanding, and he stayed that way for most of the drive home. When the girlchild asked to go spend the night with one of her buddies, I could hardly blame her for wanting a break from his hollering. Eventually, he napped and was much more cheerful and agreeable while we thought about supper. I decided that, after the disappointment of lunch, we were due for a top of the line barbecue experience and so we went to Heirloom Market in Smyrna. I first wrote about this amazing restaurant last spring and, while I’ve had the pleasure of stopping back by a couple of times, Marie hasn’t had the chance. She was definitely overdue. Over time and mentions in subsequent chapters, I might have made it clear that I think Heirloom Market is the very best in the Atlanta area. That’s not to dismiss or belittle the really good work of, say, Fox Brothers or Sweet Auburn, but Heirloom Market is my personal favorite by a nose. Their prices are good, the food is completely terrific, and the staff is outstanding. The only sore point is the lack of space; every trip I’ve made, I have felt lucky to have found a parking place. There is no restaurant in America that I wish would move to a bigger place as much as this one. While Marie and the baby shared an awesome pulled pork sandwich and beans, I went with the brisket, along with Brunswick stew and onion rings. Everything was as good and smoky as you can get. Marie and I enjoyed each other’s company, and the occasional bits of eavesdropping other conversations around the communal table in the center and the spaces along the windows. On this warm Saturday evening, they attracted a pretty good crowd of barbecue fans like us, only younger. It was pleasantly amusing to overhear people comparing Heirloom to Fox Brothers, or personal favorites back home in Texas. In fact, it’s downright wonderful to overhear the majority of a restaurant just talking about the food they’re eating. Perhaps most other times, they’re grumbling about movies or sports or whatever, and this was just a synchrony of the stars lining up, but it made us smile. And then talk about the sauces. Posted on December 20, 2012 August 28, 2017 by Grant G.Posted in atlanta, barbecue, georgia, goodbyeTagged atlanta, atlanta - western suburbs, barbecue, barbecue - our favorites, children's museums, closed!, georgia. I just remembered I owe you pictures from this less-than-stellar meal. I truly enjoyed the company – may the next meet-up be memorable for its good service and food! Merry Christmas to you and your family! Indeed! We’ll have better luck next time, after the holidays! If you ever get a chance, the Children’s Museum in Cincinnati is awesome. Much bigger than the one in Atlanta…. Hmmm! How to respond to that but to say… stay tuned! Can’t wait to get back to Heirloom Market…so far the best bbq I’ve found! We almost stopped back in tonight, but the lack of parking stymied us. I really do wish they’d find a larger space. S’More closed in late 2014.